I decided to get my Valentine's Day nail art out of the way early, since recent patterns have shown that I tend to completely miss/barely make it in time for a holiday. I'm usually pretty stumped for unique Valentine's Day nail art, so I'm going to go ahead and assume that this will be my only nail art for 2014. 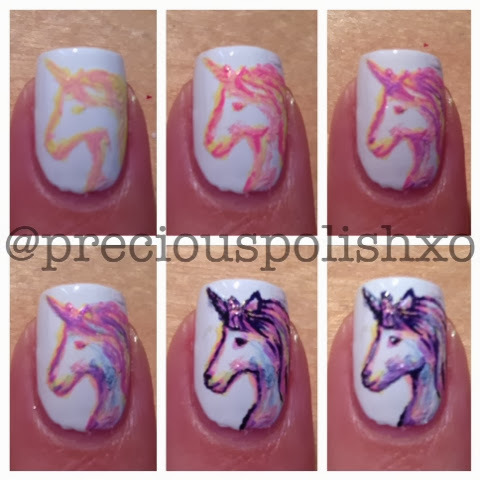 Luckily, I managed to meld some ideas together to create today's nail art! The words 'comic', 'pop art' and 'Roy Lichtenstein' have inhabited my very lengthy list of 'vague nail art themes without actual plans' for a good while now. I've always been interested in the comic/cartoon nail trend, but wanted to put my own spin on it. With love in the air I was reminded of images of heartbroken, teary-eyed females, in a classically retro Roy Lichtenstein-esque style. 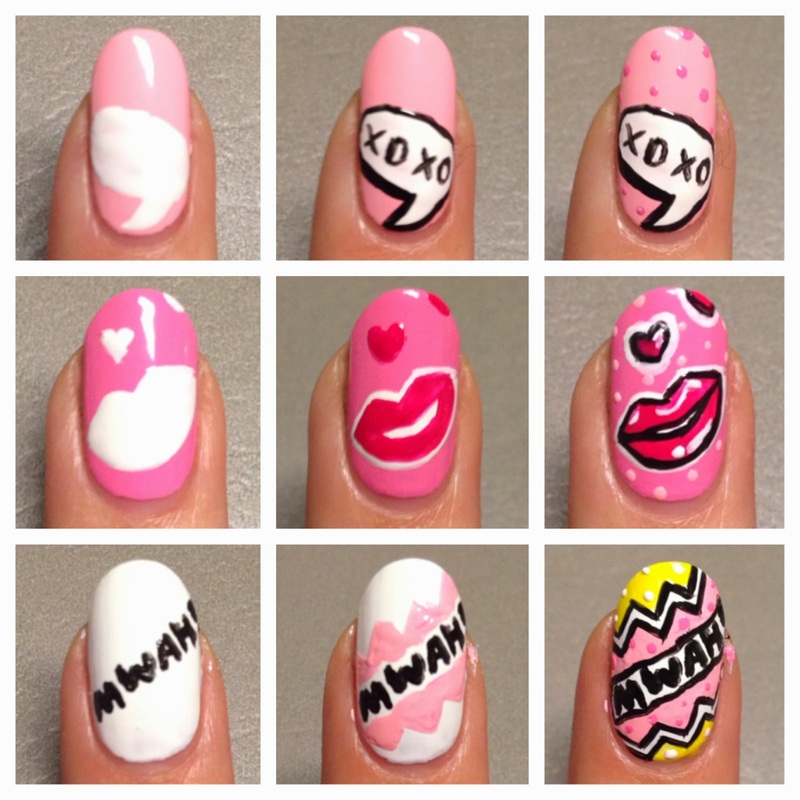 The resulting nail art contains Valentine's day motifs in a comic style, complete with its very own heartbroken lady- because what's love without heartbreak? I used the following colours by American Apparel with striping brushes and small nail art brushes: T-Shirt, Hassid, Sunshine State, Coney Island, Flamingo, Angelique, French Lilac, Downtown LA, Summer Peach, and Santorini. Hi there! After many days without anything interesting on my nails, I decided that I wanted to try something more technical and patience-requiring. 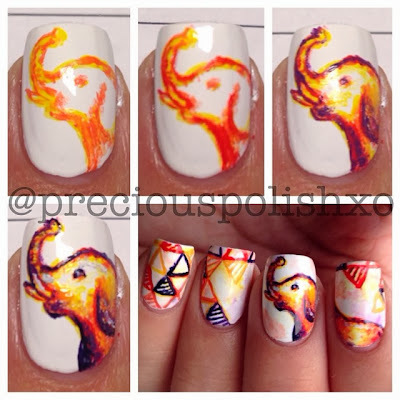 To be honest, the soft, blurred strokes I've been doing for my animal nail art has allowed for me to be pretty sloppy. I haven't touched my striping brushes in what felt like ages (probably several months), so I knew it was time to brush up on my linework. I settled on these very graphic (also intimidating) Shepard Fairey/Obey Giant designs and worked away for a good three hours. I really like how cohesive Fairey's different pieces are in terms of colours and recurring themes, and his intricate designs looked like a good challenge. Overall I am satisfied with how these turned out. Some of the lines are a bit off, and I had to redo a lot of the more detrimental mistakes that, thankfully, are now gone, especially with the Andre the Giant faces. I'm also quite happy with the proportions, though this curved nail shape still surprises me when I expect to be able to paint all the way to the corners of square nail shape. I started off with a base of American Apparel T-Shirt. The designs were done with nail art and striping brushes using American Apparel Hassid and American Apparel Downtown LA. 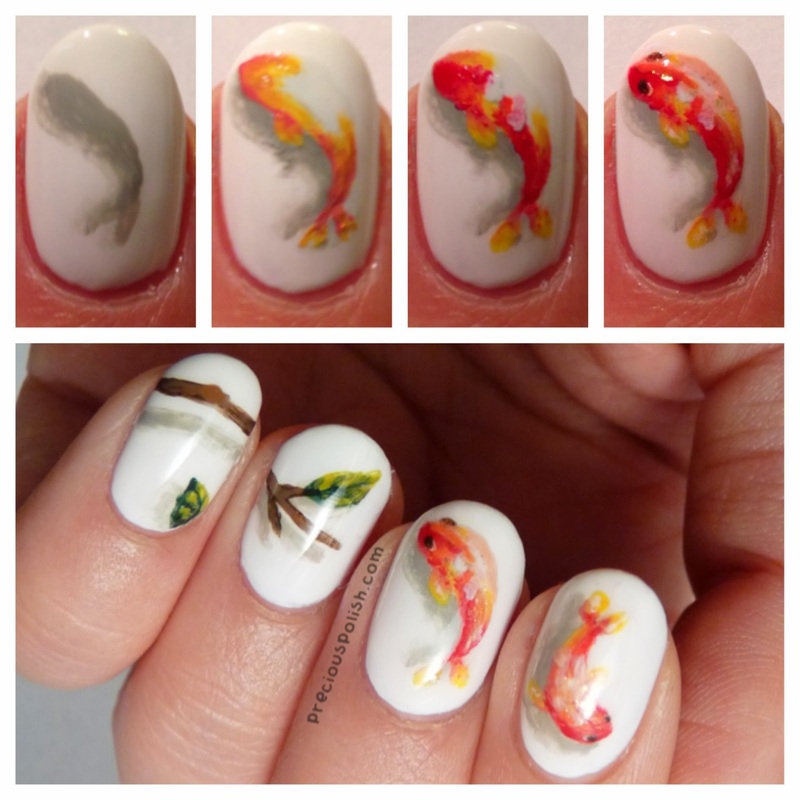 I know this nail art won't please everyone, but I hope that some of you liked it, and thank you for reading either way! Stay warm and have a good day. Happy new year to all of you! I've been quite busy over the holidays and with exams before that, but here I am to kick off 2014 with something new for you. These are inspired by the incredible resin works of Riusuke Fukahori and Keng Lye. These artists paint between layers of resin to result in a hyperrealistic, 3-dimensional image of fish mid-swim through water. If you have a spare moment I highly recommend checking out this link for more information, photos, and a video of the mind-boggling process. Here I tried to recreate the effect by sandwiching polish between layers of base coat. My version resulted in quite a different effect from the inspiration, but I'm satisfied overall and looking forward to developing this technique in the future. I started with a base of American Apparel T-Shirt. I used a small paintbrush to start painting the shadows with American Apparel Echo Park, diluted with acetone. After a layer of base coat I painted the base of the fish with American Apparel Rose Bowl and American Apparel Manila. After another layer of base coat I used American Apparel Downtown LA, American Apparel Sunshine State, and American Apparel T-Shirt. Another layer of base coat and finishing touches with American Apparel Mannequin, American Apparel Raccoon, and Essie As Gold As It Gets, all sealed with a final layer of topcoat. The branches and leaves followed the same process with additional polishes American Apparel MacArthur Park, American Apparel Hunter, and American Apparel Makeup.